"We are already missing the quiet tranquil surroundings, that allowed us to de- stress from our busy lives; we have already booked for next year." Kefalonia is perhaps best known as being the location of the film Captain Corellis' Mandolin. Based on the novel Corelli's Mandolin by Louis de Bernieres, Captain is set on the island in early World War II. The Italian army has gained control of the island, led by Captain Corelli (Nicolas Cage), a man who appreciates good music and beautiful women. When Corelli begins a passionate affair with Pelagia (Penélope Cruz), a local beauty engaged to marry a town fisherman (Bale), a dramatic love triangle occurs, in which all involved are forced to weigh the power of their allegiances against the strength of their love. The beauty of the island is perfectly captured in the film and the locations are popular places to visit- there is a DVD copy of the film in the villa for guests to enjoy. But the real Kefalonia in the 21st century is just as romantic, utterly enticing and certainly as beautiful. Kefalonia is the largest of the 6 Ionian Islands. 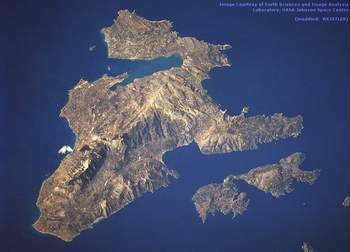 The closest other islands are Zakinthos and Ithaca; further north are Corfu, Paxos and Lefkada. Kefalonia is an island of many contrasts with green rolling hills, dramatic scenery, stretches of clear blue sea backed by golden sands, unspoilt traditions and a simple laid back way of life. From an archaeological point of view Kefalonia is an extremely interesting island. Archaeological findings go back to 40,000 BC. The island has been part of many different empires from Byzantine, through Venetian rule to periods of French and British rule until finally there was union with Greece. In World War II Kefalonia was occupied by the axis powers which were mainly Italian. The island was largely spared the fighting, until the armistice with Italy concluded by the Allies in September 1943. Confusion followed on the island, as the Italians were hoping to return home, but German forces did not want the Italians' munitions to be used eventually against them; Italian forces were hesitant to turn over weapons for the same reason. As German reinforcements headed to the island the Italians dug in and, eventually, after a referendum among the soldiers as to surrender or battle, they fought against the new German invasion. The fighting came to a head at the siege of Argostoli, where the Italians held out. Ultimately the German forces prevailed, taking full control of the island, and five thousand of the nine thousand surviving Italian soldiers were executed as a reprisal by German forces. While the war ended in central Europe in 1945, Kefalonia remained in a state of conflict due to the Greek Civil War. Peace returned to Greece and the island in 1949. The house was completed in 2010 and is privately owned. It was built to a very high specification and designed to offer everything you could want in a holiday 'home from home'. It has an extensively equipped kitchen, 2 living rooms (one of which is poolside & can sleep an extra 2 if required), 3 double bedrooms all with en suite wet rooms, 2 additional cloakrooms, a large tiled pergola-covered terrace with built in barbecue, plus a second more protected dining terrace with seating. There is also a further shaded dining area poolside. The property sits in it's own grounds nestled on a ridge and has spectacular views across a verdant valley to the sea and to the neighbouring island of Zakinthos ( Zante). Gilly's Place is within 15 minutes drive of the airport in the village of Lakithra overlooking a beautiful valley with stunning sea views to the neighbouring island of Zakinthos. Lakithra is a delightful and friendly village with a bakery, patisserie, and mini market; it has 4 excellent tavernas plus George's bar - possibly the smallest bar on the island but one with a big welcome ! 3 large supermarkets and an excellent butcher are within 10 minutes drive of the villa. Argostoli, the capital of Kefalonia , is a short 15 minute drive away where you will find excellent shopping, a daily harbour-side market, a lively town square and a large choice of tavernas. To enjoy the villa and the island fully, car hire is essential - Gilly can recommend an excellent car hire company.